The Discovery of the Tomb of Tutankhamen , by Howard Carter, was simply sensational! I do not understand people who say that history is boring. What is boring about finding 3,000 year old "buried" treasure and an ancient pharaoh's mummy!? 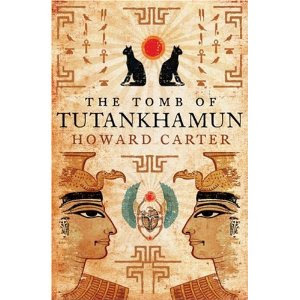 I picked up a copy of The Tomb of Tutankahen, by Howard Carter on the aforementioned trip to the used bookstores. (Seriously - best used book shopping day EVER!) My original reason for selecting it was that Howard Carter was connected to 5th Earl of Carnarvon (a fact I discovered when reading Lady Almina and the Real Downton Abbey - linked to my review). That, and I've always been morbidly curious about mummies. I remember my mom teaching me about them when I was being home schooled and my being simultaneously repulsed and curious at the same time. I've never bothered to explore Ancient Egypt as an adult, but now that Bookworm1 and I are going through The Story of the World (linked to our experiences so far) I'm finding excuse and opportunity. (Really, the parent must learn before they can teach! Reading is important. Always important. If you want your kids to love learning and reading, you have to learn and read yourself!) Of course, the subject of golden treasures is much more fun to read about than, say, Algebra. Anyhow, the copy of this book which I picked up is copyright 1954 and contains "17 color plates and 65 monochrome illustrations and two appendices." The title, as I've linked to on Amazon, advertises over 100 photographs. I'm sure a more modern printing would have a wider variety of images to choose from, and depending on which edition you pick up you'll see that the book is by "Howard Carter AND _____". My edition lists only Carter as an author and mentions that this is a collection of an installment of articles which Carter wrote about the discovery. The tomb was discovered in 1922 and he wrote these installments between the years 1923 and 1933. During that time, excavation of the tomb was still underway. Artifacts were being cleaned and examined, and there were still more questions than answers about King Tut, the Ancient Egyptians and the various items uncovered. It would be curious to read a more up-to-date edition of this book at some point. At the same time, I liked reading the installments in the order he wrote them, feeling as if I were experiencing the wonder of this treasure right alongside the 1920's audience. It's very fun to tell yourself to think 1920's as you read. It makes reading the articles ever so much better. What does this book tell us? 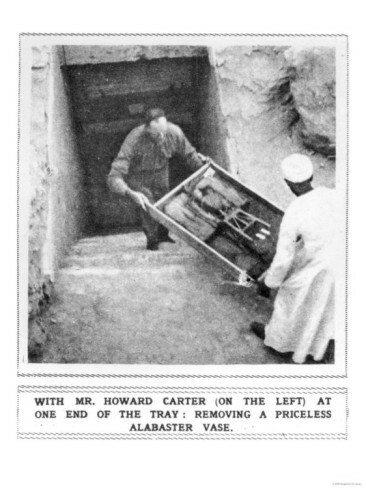 It tells us of Carter's (and Carnarvon's) strong belief that King Tut's tomb remained hidden in the Valley of the Kings, contrary to the opinion of other archeologists who had excavated in the area. Carter relates his passion for trying to find Tut, as well as the discouragement in the search, running out of both time and money. Then he describes finding the first step which leads to the hidden underground tomb. Then he relates the joy of discovering Tut's name on the door. He also uses fun words to describe his discoveries, keeping the (2012 thinking like a 1920's) reader waiting with bated breath to see what happens next. In today's world we are awed by so little. You have to work to stretch your imagination to understand how thrilling such a discovery would be. Carter is clearly working hard in his articles to excite the reader and describe what he sees inside the tomb so that the readers will be able to see and feel things for themselves. He is very descriptive in an enchanting way. Clearly, he was passionate about his work and wanted to share the joy of it with others. Frankly, it's hard to capture that sense of wonder but I think it's important that we do -- not just in reading this book but in our every day lives. Technology really messes with our ability to be imaginative and I hate that. I, myself, am prone to watch more movies or play games on the iPad (Tetris. Hello, my long lost Nintendo friend!) than I am to sit and just imagine fun things and fun stories. (Ok. Jonathan might find my imagination a bit untamed at times.) We've made so many discoveries that, by now, our modern minds are used to the idea of treasures being uncovered and every mystery explained. 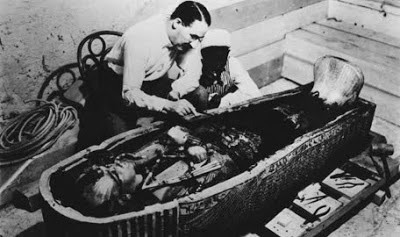 But back in 1920's, Ancient Egypt was still full of mystery and this was a great and wonderful discovery! My modern mind questions the workers' enthusiasm for their task. And I think he would not get away with saying that it was a "pleasure to watch them work" in today's society. Probably he would also not refer to them as ants. (He didn't, really, but people would will say so.) Of course, I think he would be raked over the coals for a great many things these days. "A word may fittingly be said here in defense of the unwrapping and examination of Tutankhamen. Many persons regard such an investigation as in the nature of sacrilege, and consider that the king should have been left undisturbed. From what I have said as to the persistent robberies of the tombs from the most ancient times up to the present, it will be understood that when once such a discovery as that of the tomb of Tutankhamen has been made, and news of the wealth of objects contained in it has become known, to leave anything whatever of value in the tomb is to court trouble. The knowledge that objects of immense value lay hidden a few feet below ground would certainly invite the attempt to obtain them, and while the employment of a strong guard might suffice for a time to prevent any such attempt meeting with success, any remission of vigilance would instantly be seized upon, and objects which are now safely housed for all time in the Museum of Antiquities would have been destroyed, while others would appear in a more or less dilapidated state in the hands of dealers through whom they woud soon be dispersed to all parts of the civilized world." He makes a very good point, I think! If you are studying Ancient Egypt, or are just curious, I think I would urge the reader to find a copy of The Tomb of Tutankhamen, by Howard Carter, that is not updated with additional photograph or commentary from modern scholars. First, dive into these articles with the intent to view his discoveries through eyes of wonder. Picture the tomb and the items in your mind's eye as Carter describes them. Think about the hardships and struggles involved and how enormous this discovery was. Appreciate the difficulties in travel, the great extent Carter and others went to preserving these artifacts and the many questions that will still remain when you finish the book. Those questions are good for they will make you want to read further and learn more! Start simply, build up. Enjoy the mystery of it and appreciate the beauty uncovered. I'm so glad that I read this book, and I'm equally excited to say that it looks as if we're going to be able to visit the traveling King Tut exhibit in Seattle here in the next few weeks. Looking forward to this -- very much!! Very interesting, Carrie! I'm interested in Carter, too. In fact, we've read a pretty good picture book or two about the discovery. I'll try to look them up for you and link back. Steady Eddie and I went to a Tut exhibit in Atlanta a few years ago, and it was good! I wonder if it's the same one? Here you go--The Tomb of the Boy King. The others are good, too, though not about the discovery. That sounds very cool! I must look it up sometime. If you're on an Egypt kick, I can heartily recommend *Temples, Tombs, and Hieroglyphs* by Barbara Mertz (Pen name Elizabeth Peters, author of the Amelia Peabody books), who lists as her criteria for inclusion, "Anything I found interesting." It's a great read and still a pretty organized overview. I was just going to mention that King Tut exhibit! We haven't been able to get there yet and don't know if we will, but we saw a fascinating Egypt exhibit several years ago in Portland. This looks like a lot of fun! We've watched a few documentaries on ancient Egypt and my oldest is hooked on the subject. I'm sure he'd love a trip to the museum to see artifacts! It sounds like a very interesting book! It's a bummer that most kids are made to feel as if history is boring (I know I did). I think that's a byproduct of most public schools. As an adult, I read a few history books and am always pleasantly surprised at how enjoyable it is. It's just hard to get past the "history is boring" mindset. You also warm my heart by your use of "bated." Excellent, thoughtful review. I grinned because THIS is what I read for fun!! Egyptian history is enthralling! Unfortunately I didn't develop a love for history until my freshman year of college with History of Civilization due to an amazing, wonderful teacher. Other students hated that class but I soaked it up. Unfortunately that was my last history class! I've had to learn it since on my own. But a love of learning and reading fostered that. I think it's so neat you're developing that love in your kids early. This explains the squirm inducing Facebook post about embalming. Hahaha! I agree about your thoughts on history. Every time I read history I'm thinking, "How is this not EVERYONE'S favorite topic?"